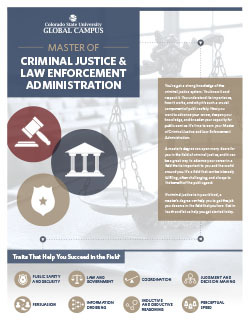 To be a successful professional in criminal justice and law enforcement administration, you will need to understand how criminal justice organizations function, how to manage the people and issues that you will face regularly, and how to build programs and policies through community involvement and collaboration. Our online Master of Criminal Justice and Law Enforcement degree prepares you for all of this and more. Examine crime and control from a range of theoretical perspectives and from a global spectrum. Identify and read research studies in academic and scientific sources and understand them in terms of design, data collection, and analytical method. Assess and synthesize scientific evaluation research in policy analysis and recommendation. Discuss the roles, strategies, and impacts of effective leadership and management. Evaluate the role of community-based justice in preventing crime and the “revolving door” and explore strategies of engaging community in justice planning. 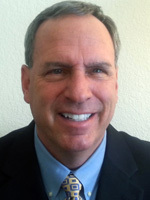 Appreciate professional ethics for criminal justice organizations and professionals and demonstrate the ability of exercising ethical judgment in the events emerging in professional fields. Show current knowledge of high-tech and occupational crimes in cause, detection, investigation, prosecution, and prevention. We will help you customize your online degree in criminal justice and law enforcement administration by adding a specialization. Similar to a degree concentration, each specialization consists of four courses in your chosen area of interest. CSU-Global’s accredited Online Master’s Degree in Criminal Justice and Law Enforcement Administration is designed to provide you with practical knowledge of the field. The program consists of eight three-credit core courses as part of a full 36-credit master’s degree. "The pride I have in achieving a Masters Degree from CSU-Global provided me with the confidence to attain the career plan I had envisioned."